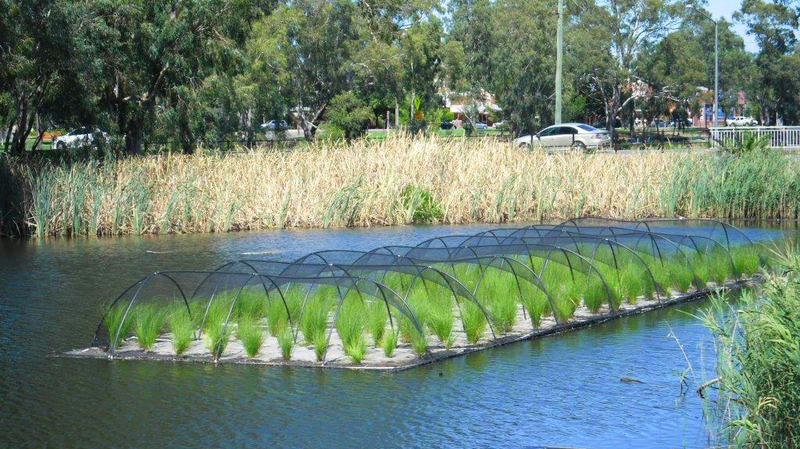 The Aqua Biofilter™ floating wetland treatment technology that can be utilised within a wetland treatment train either retro-fitting or designed into future wetlands. Detention basins can be designed larger & deeper, effectively providing more storage and Hydraulic Retention Time (HRT). 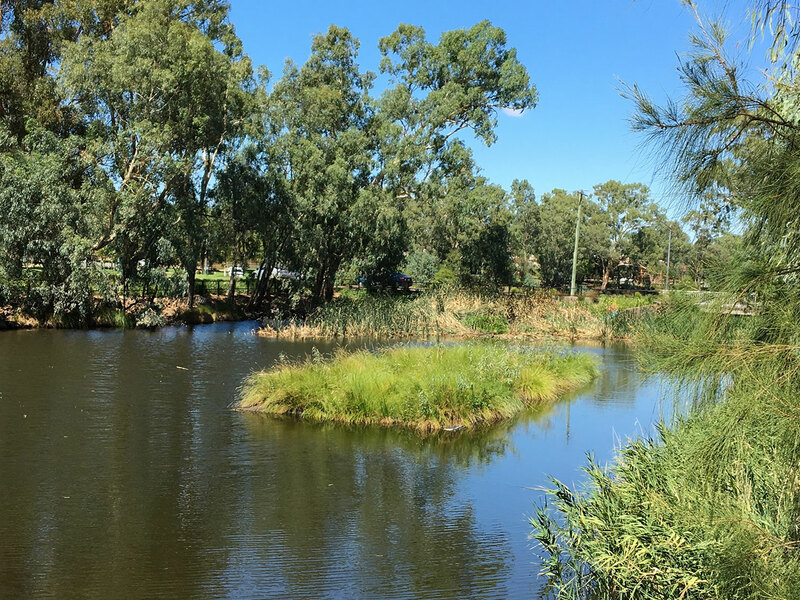 Wetlands can also be sized smaller as a result, bringing down costs, achieving best practice and effectively treating TN, TP, TSS, COD, BOD and reducing heavy metals. 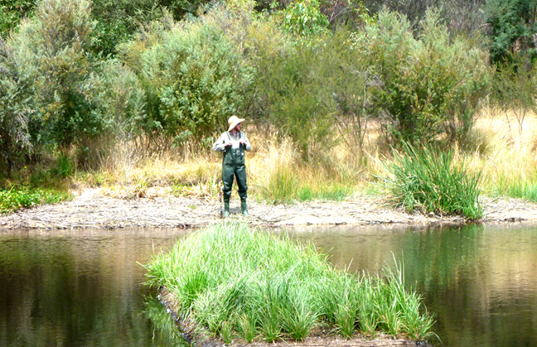 Ecological restoration of aquatic environments is now easier than ever before. AquaBiofilterTM utilizes a biomimicy approach to product design and development, harnessing the power of biological systems for restoration and remediation. The Aqua Biofilter™ functions by removing nutrients and pollutants from waste water, stormwater and aquaculture water, through biofilm contact with our unique Aqua Biofilter™ technology and the plant growth that our products support. Wetlands are the kidneys of the landscape, purifying and cleansing waterway pollutants, heavy metals, and excessive nutrients. 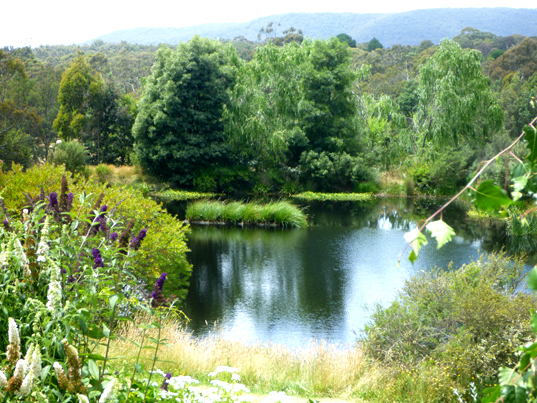 Often wetlands and ponds accumulate excessive sediment, nutrients and pollutants whilst water quality declines, algal blooms and aquatic weeds proliferate reducing biodiversity. Restoring ecological function and healthy biological activity requires natural systems that mimic peak ecosystems – which led us to design and development the Aqua Biofilter™ in 2000, to improve water quality beyond existing methods for ponds, wetlands and waterways. Since 2000 Tom has been building aquaponics systems in largescale and small scale aquaculture systems across Australia, Malaysia and China. 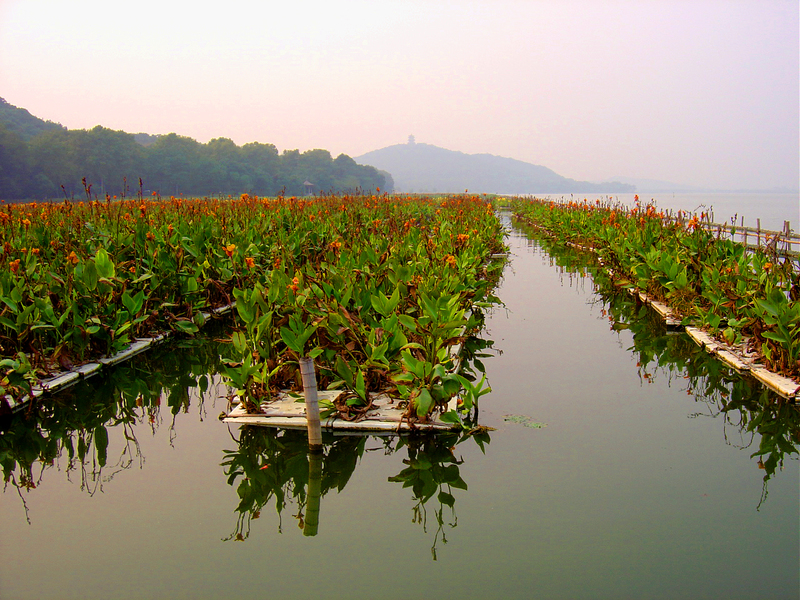 Aquaponic floating wetlands pictured above was installed over several hectares (over 4 acres) of aquaculture zone in Lake Taihu, China. The aquaculture was being impacted by stormwater and cross contamination with effluent, whilst fish waste led to ammonia build up and exacerbated algal blooms. 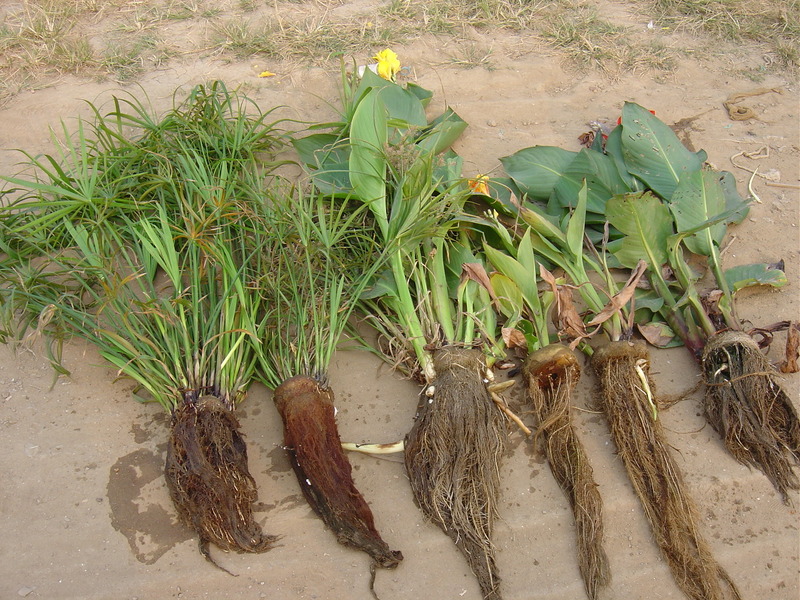 Canna lily feature an edible rhizome with carbohydrates for animal feed. Experimenting with food crops, wetland species, native sedges have led to in depth knowledge of plant – fish interactions, growth cycles and smart design principles to accelerate plant growth and purify water quickly. Image Credit: Tom Duncan. 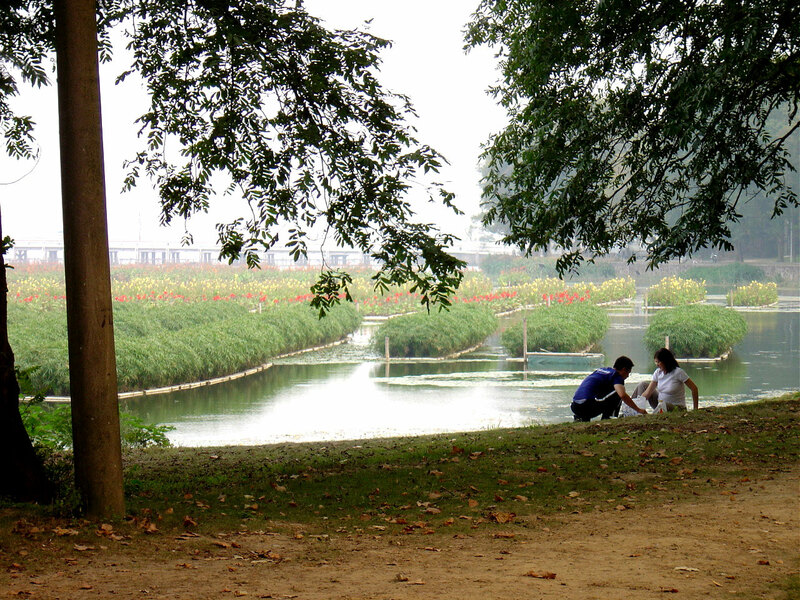 The above 3d design of floating wetlands was for the treatment of combined waste water and stormwater 2004. In some zones the floating wetlands were connected sub-surface with a maze of baffles that forced the water column pollutants through the vast matrix of plant roots and biofilm. This approach brings the efficiency of a maze channel and baffle waste water treatment plant approach, that can be retro-fitted into existing lagoons, ponds or lakes. The floating wetland maze creates maximum surface area treatment by moving the water along the slowest and longest possible route through the maze, removing more nutrients and pollutants as the water passes through the sub-surface maze. Above image in 2004 at Lake Taihu shows the floating wetlands using open cell polyurethane filter foam in combination with a closed cell foam for floatation shown in previous photos above. Filter foam is non-toxic and does not leach toxic compounds into the water, unlike cheaper foams such as carpet backing foam or combiations of foams. Filter foam is utilised in aquariums for biofiltration media and is therefore suitable for aquaculture, lakes, waterways, ponds, dams and other freshwater bodies. Marine applications are also suitable, encouraging plant growth in a biofilter medium. Our research demonstrates that filter foam however is not as high performing as natural materials in supporting plant root growth. Natural materials have been used for aquaponic floating islands, reedbeds and wetlands for centuries such as reeds, coconut materials, bamboo materials, jute materials and many more are being studied around the world. The above materials have been used in Floating Wetlands and islands across the world from the 1990’s, yet our proprietary design innovations are responsible for the vastly improved water quality improvements outcomes. Above installation at City of Wagga Wagga at 9 months growth, eradicating algal bloom in central business district, increasing water transparency, removing nutrients, suspended solids and metals. The surrounding catchment in-flows are urban and also rural run-off from farming districts. 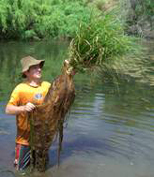 Water quality is visibly clearer than previous years during summer, indicating removal of nutrients. Amazingly trees have colonized the floating wetland and habitat islands and started growing. This demonstrates the ecosystem succession platform that the AquaBiofilterTM Floating Wetlands and Habitat Islands provide. The increasing biodiversity of these islands brings year on year improvements in both water quality and habitat provision both above and below the water. 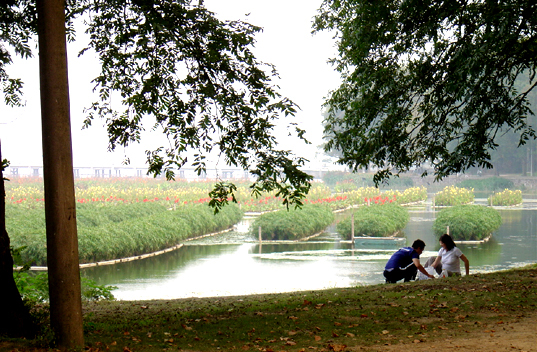 Above project, growing wheat experimentally in the Nanjing eco-city development with Prof Pu. 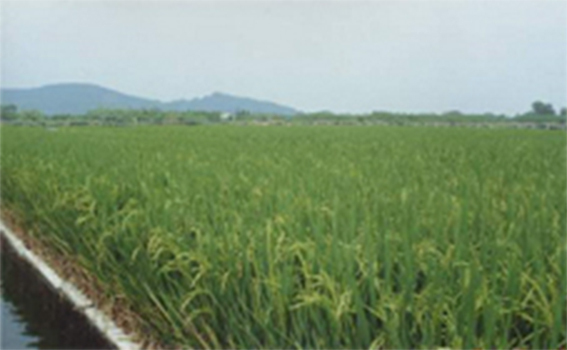 Wheat was grown in urban waterways and canals in a new residential area of Nanjing. The project also interacts with a biodigester to treat on-site waste water from the surrounding urban and office developments in Nanjing’s constructed canals. Above project rice aquaponics growing on fish ponds to remove excess nutrients and provide and economic return for farmers. Social benefits include reducing nutrients and pollutants impacting receiving waters, lakes the marine environment, and enhancing human and fish health outcomes. 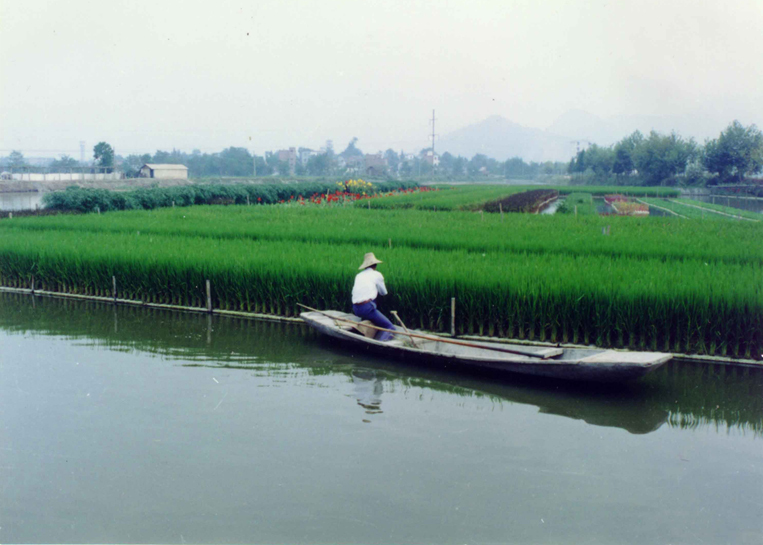 Above project growing over a hectare of rice on fish ponds aquaponically to reduce ammonia and nitrogen, producing 20% more rice 15% faster than conventional rice paddy. Advanced Biofiltration Research and Technology development has been an emerging science for the last 30 years. Installations in Australia, Malaysia and China and USA have demonstrated the feasibility of the technology, and its applications in aquaculture, stormwater treatment, sewerage and on-site sewage treatment, industrial effluent treatment, often for water re-use. 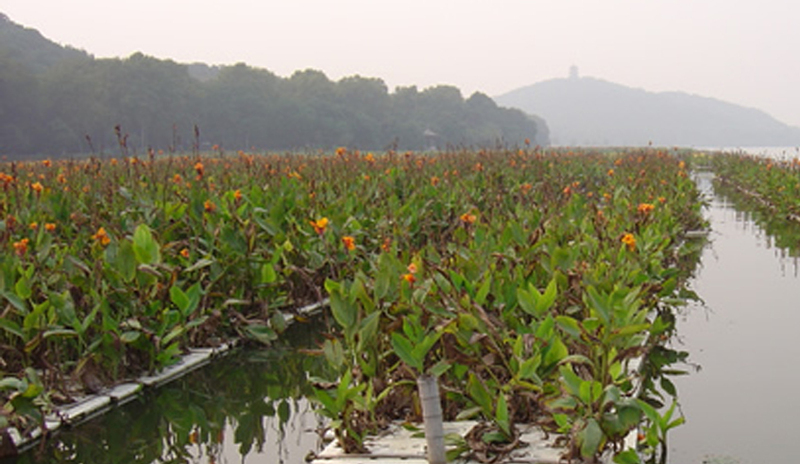 Floating wetlands and reedbeds installed in China, covering acres of lake and fish ponds with rice, canna lily, sedges. Lake Taihu lake water improved from Class 5 dirty water, up to Class 1 Freshwater Lake class in 3 months.